Overview: With its new iSevens Classic Slot game release, third millennium gaming developer, BETONSOFT, drags the online entertainment industry kicking and screaming into the 21st century. A futuristic feel to the game lends itself more to the command deck of the Starship Enterprise than other (old school) Classic Slot offerings. Aluminium, chrome, electric colors and animated graphics all deliver a first in the Classic Slots world and really does add something truly unique to the player's gaming experience. 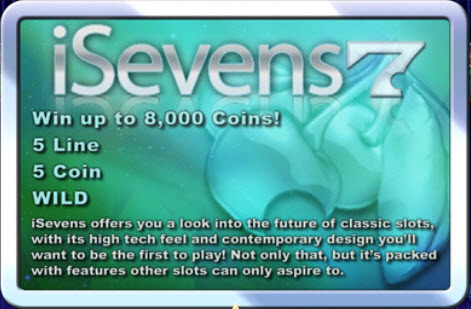 The high tech feel and contemporary graphic design of iSevens are further complimented by coin denominations from 0.01c up to 1, 00, maximum wins of 8,000 coins and a 5 coin max bet. Paylines are also more in line with what players expect from the Video Slot genre, with triple the chances to win across 9 paylines. 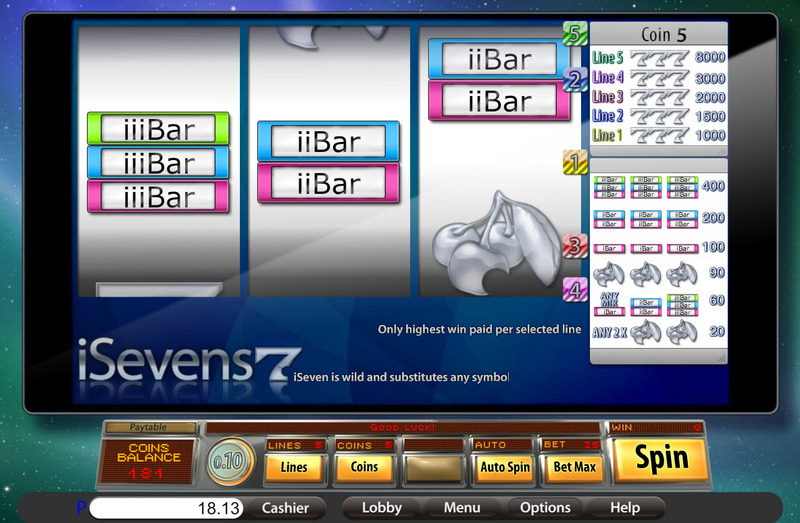 iSevens Classic Slot ushers in a new dawn for this gaming genre. BETONSOFT is proud to be leading the march towards greater player satisfaction! Similar Slots: If you like iSevens, you might like these other slot machines from Saucify: Cash Flow - Progressive, Diamond Dare, Pina Nevada, Runaway Train, Stars 'N Stripes 777.